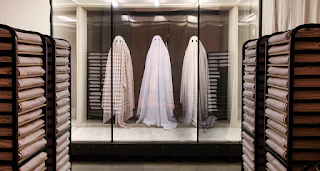 Ghost Store is a pop-up shop in between a sushi joint and a tea garden in Chinatown in lower Manhattan. This super spooky marketing stunt is produced by A24's and meant to give people the opportunity to experience David Lowery's Sundance hit, A Ghost Story, first-hand. The pop-up shop sells sheets for you to wear on the other side. You can watch the live feed of the store here. The movie's soundtrack is playing in the background, kind of creepy, kind of awesome. I don't know about you, but I feel like I'm spying on these people as they experience a possible afterlife and it's pretty darn interesting. Customers are greeted and asked to complete a questionnaire which includes questions about your earliest memory as well as some pretty personal stuff to pontification as you have this experience. You're then given a white sheet with two eye holes and escorted to the back of the shop. Painted across the stark white walls includes notes like, "The transition from active participant to passive observer can be a difficult one," "There is no going back," and "It's time to let go." 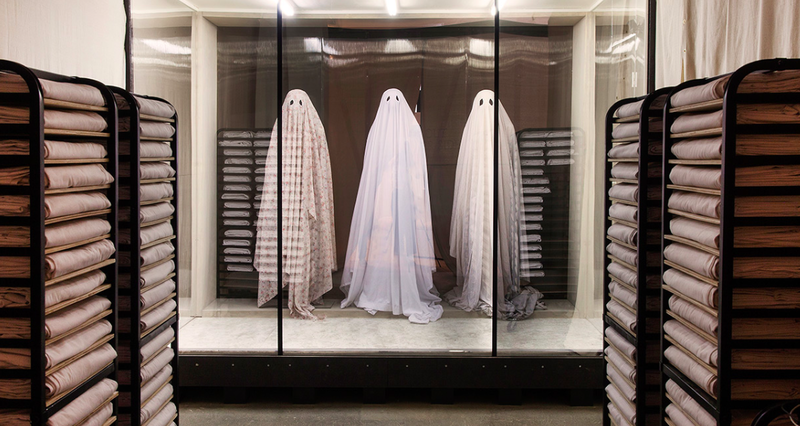 A Ghost Store is located at 51A Chrystie Street and has been open since mid June. It will continue through the end of next week, however, they've hinted at extending the experience and staying open longer.